Indonesia is a country polarized by class, socio economic status, education and health. In such a large country in which a strong collectivist mentality is held a shift will only be observed through the engagement with Indonesian society as a whole. It is the aforementioned collectivist mentality that needs to shift in order to see progressive change in Indonesia’s waste management strategies. Legislation, government-based initiatives and political reforms tackling waste management have proven to be inefficient and are ill-equipped to tackle the severity of the issue. Jakarta’s 13.2 million population alone produces 6,250 tons of rubbish each day (World Population Review 2015), enough to fill a soccer pitch five meters deep (Lucas 2014). The lack of waste management systems have resulted in a myriad of environmental, health and social issues. Designers, makers and thinkers are leading a social and cultural movement towards ethically sustainable futures and communities. Designers and collectives such as Sapu, XS projects, Kelingan and Ruangrupa are currently tackling the waste management issue in an engaging manner. Innovative techniques using products, systems and ideas such as upcycling and community driven initiatives are at the forefront of this change. These ideas however, are facing a number of obstacles. Local groups have limited resources and understanding of consumer habits. Furthermore, the push toward rapid commercially driven design renders sustainable practices uneconomical. Consequently it became clear to our group that the issue is not a matter of a improving the quality of the product. Rather, it’s the simple fact that these local designers cannot effectively communicate their ideas with the global community. Our first hand research revealed that the organization such as Fair Trade use complex accreditation systems. This results in many local designers being unable to receive this necessary tick of approval. In a market saturated with claims of sustainability it is essential for the consumer to be able to trust the products origin. Unfortunately the complex procedures necessary to obtain a legitimate accreditation means many of these ethical brands are unable to connect to the global audience at which their products are targeted. At Kolektif our aim is to discover, promote, manage and circulate fresh, innovative ideas of inspiring designers, while connecting Indonesia with a global audience. Kolektif is an online platform that independently accredits and promotes a curated collection of local produced and sustainably created products. We’re seeking to connect buyers to makers through promoting emotionally durable design. 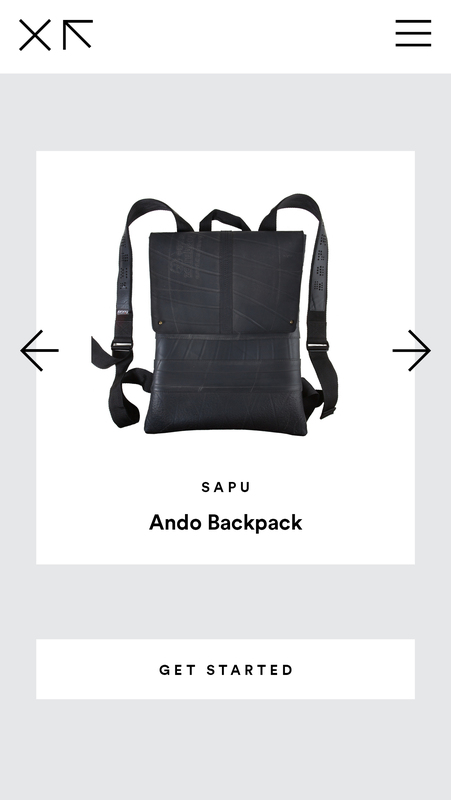 Our site promotes considered comsumption on consumer goods through unique distribution methods. These methods allow shipping costs to remain affordable while curbing the instant gratification that’s become ingrained in consumer culture. Customers furthermore have access to a customizable app, triggering a dialogue and new forms of collaboration between global audiences. The ‘Meet the Maker’ blog further builds personable relationships between buyer and maker, allowing global audiences to have further insight into initial production right through to reception of their purchase. 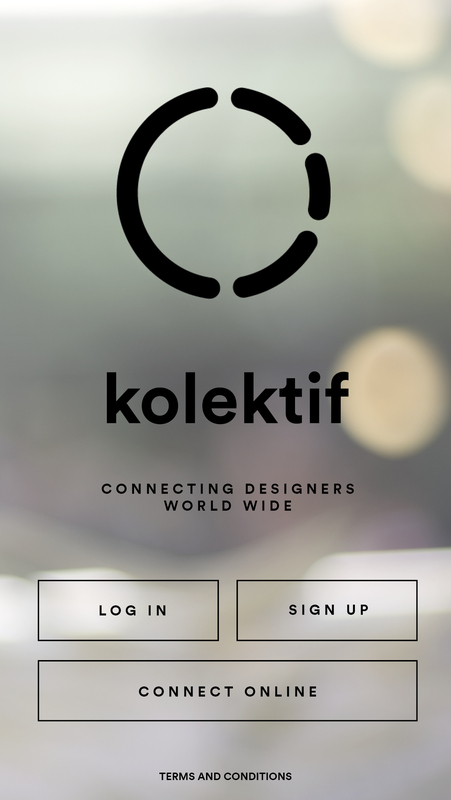 In short, Kolektif is an open source, social marketplace that promotes local designers and grants them access to a global audience. We believe that through telling the stories of our partners we can help to promote a more personal dialogue with the maker. We firmly believe that consumers worldwide will respond positively and be more considered in their spending habits. Through a global effort we will see real and effective change regarding waste management and sustainability. By connecting like-minded people, groups, collectives and organizations an environment can be established in which a realistic global effort can take place. Lucas, A. 2014, Jakartas Rubbish Nightmare, Inside Indonesia, Jakarta, viewed July 6 2015, <http://www.insideindonesia.org/jakartas-rubbish-nightmare>. World Population Review 2015, World Population Review – Jakarta 2015, World Population Review, viewed July 6 2015, <http://worldpopulationreview.com/world-cities/jakarta-population/>. Environmental awareness is growing. For people like myself living in developed countries, eco-living is becoming more popular every day. But how is this going to impact the way we travel? People just like Anna have recognized the growth in the eco-travel industry. As a result eco-resorts have been built to accommodate. It would seem that in doing this the local people are able to achieve their goals of living sustainably, educating the local community and providing tourists with a more informed and educational trip in which they are able to interact with locals and appreciate their way of life. However, how deeply rooted in the local infrastructure are these establishments? When asking Anna about the future of eco-tourism in Indonesia her response was mixed. She stated that, “one needs to be careful about the label of eco-hotel. Some of the hotels already labelled themselves as eco-hotel or designed sustainable. But there are gaps in the design and practice”. I provided Anna with the example of Greenhost Hotel. A new development in Yogyakarta that they say is “the first hotel in Indonesia built using recycled materials and following conservation principles.”(Mintarga 2015) Sadly, this is a ruse. The hotel is on the right path to becoming eco-friendly yet it is not what Anna believes is the best way forward. She said that, “eco-friendly living is also growing but not yet understood by many”. As a result of this we came to the agreement that the ideal eco-hotel is one that encompasses both community, government, establishment and guest. Yabbiekayu Guesthouse just outside Yogyakarta is a fantastic example of this as you live with community members and help out in their daily tasks. Allowing both parties to learn off each other as well as benefiting the community by cultivating their gardens. I believe one should be environmentally aware when planning their holiday. It is easy to be enticed by a hotel that seems to be environmentally conscious. But one should ask. What is this doing for the community? For without community involvement and education these hotels are a short term solution to a long term problem. Mintarga in Graham, D. 2015, How green is my valet? Jakarta Post, Yogjakarta, viewed April 21 2015, <http://www.thejakartapost.com/news/2015/01/13/how-green-my-valet.html&gt;. Collectivism is the practice or principle of giving a group priority over each individual in it. Through an analysis of Indonesian culture it becomes evident that a collectivist mentality is at the core of the Indonesian social structure. By looking at social structures such as the Kampung, groups such as Taring Padi and the Wayang or shadow puppet performances collectivist mentalities are identified. Collectivism in Indonesia is not new. A Kampung translated into English is a hamlet or village. However, Kampung’s function on the idea of Gatong–royong (communal work). Anthropologist Robert A. Hahn writes, “There is respect for those who contribute to the general village welfare over personal gain. And the spirit of Gotong –royong … is promoted as a cultural value.” (Hahn 1999). However, with colonisation came capitalism and individualist ideals. Yet, Gotong-royong was still popular. This is evidenced by the strength of the communist party from 1945 until 1965. Despite capitalism prevailing collectivist ideals remained. 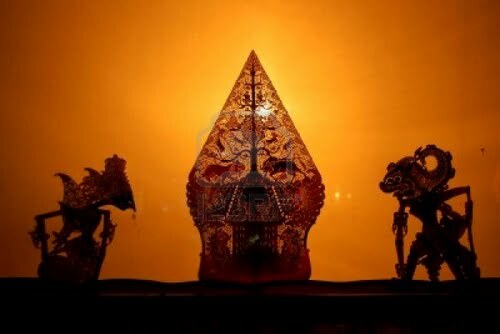 Core to Indonesian culture and learning were the Wayang (shadow puppets). The Wayang have existed since the first century CE and are still popular today. The shows teach social, cultural and religious values. They can last up to nine hours and are often put on by older members of the community, taking turns to tell the story to the younger generations. The act of sharing the load in the dissemination of information highlights a collectivist mindset and it is not uncommon to see an entire Kampung join together to keep this tradition alive. They believe in collective ownership. These ideals are a culmination of a thousand years of collectivist thinking. Supartono talks of Taring Padi’s use of “animalistic mystification of antagonistic figures” (Supartono 2011). Here they may have drawn inspiration from the Wayang. 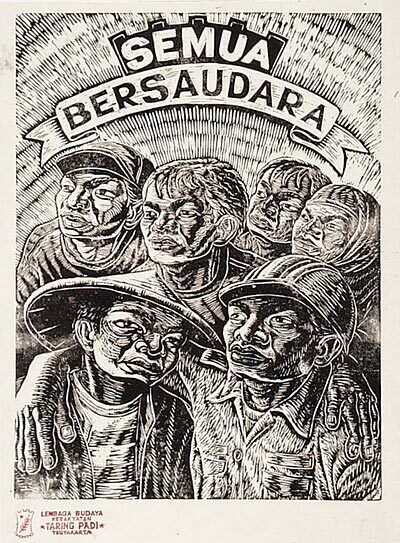 Collectivism is an idea that is central to Indonesian art and life. It permeates through every aspect of their lives and I believe it is integral to understand this if one wants to begin to understand the day-to-day habits of the Indonesian people. Dyne, J. 2009, Taring Padi Artist Collective, GPL, Yogjakarta, viewed April 20 2015, <https://jaromil.dyne.org/journal/taring_padi.html>. Hahn, R. 1999, Anthropology in Public Health: Bridging Differences in Culture and Society, Oxford University Press, Oxford. International institute of social history 2002, Posters by Taring Padi, Institute of the Royal Netherlands Academy of Arts and Sciences, Indonesia, viewed April 17 2015, <http://socialhistory.org/en/collections/posters-taring-padi>. Meili Go. 2015, Dive into the new bag collection, van ‘t leven producties, Amsterdam, viewed April 17 2015, <http://www.meili-go.com/news>. Supatono, A. 2011, ‘Pendahuluan/Introduction’, Taring Padi: Seni Membongkar Tirani, Lumbung Press, Yogjakarta, Indonesia, pp. 7-23. 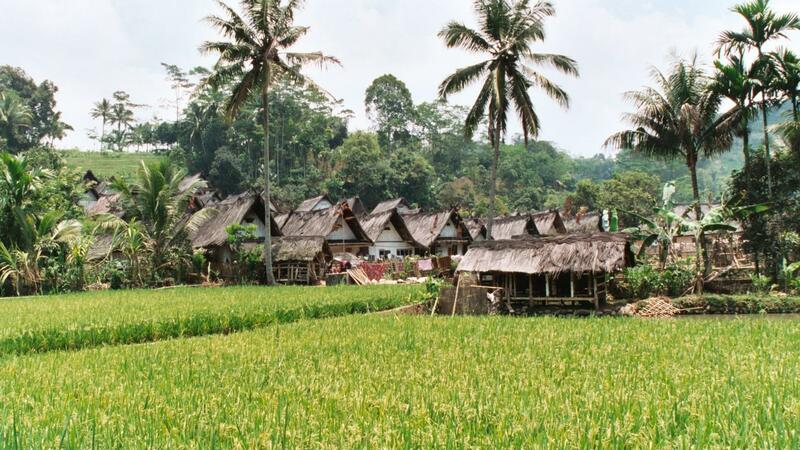 Demming, R. 2002, Kampung Naga, viewed April 21 2015, <http://rdemming.home.xs4all.nl/Travel/Indonesia/>. 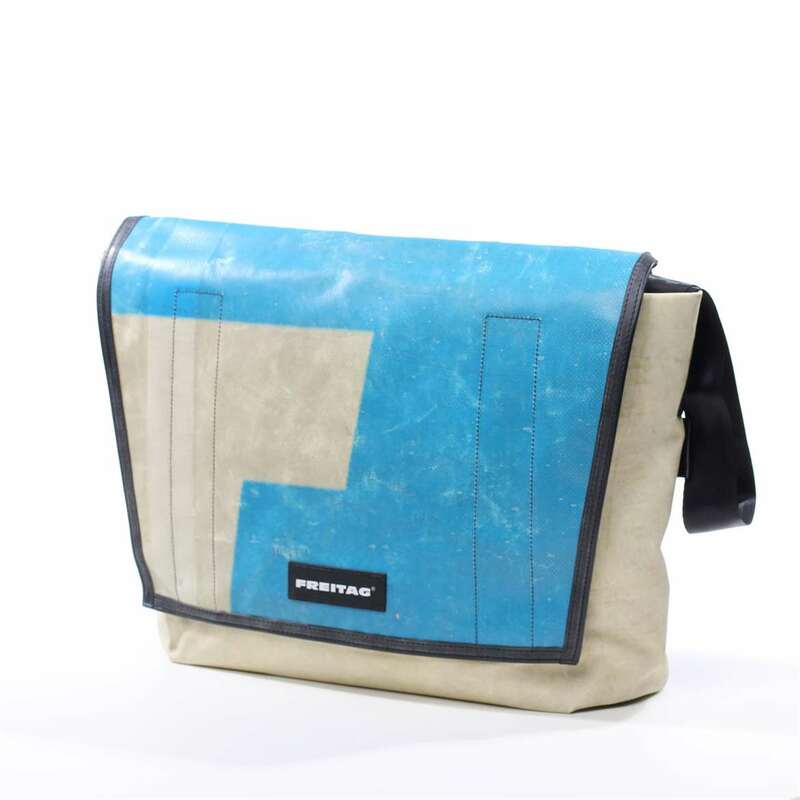 Freitag is Swiss based company that recycles old tarps used on European trucks into bags. They describe their design process as ‘recontextualising’ materials. Founded by two brothers, Markus and Daniel Freitag, who were both trained in the field of Graphic Design, Freitag is a self-made company that have grown from simple beginnings into a well renowned company, selling their more than 40 different models all over the world. The brothers first came up with the concept in 1993. They were looking for a way to transport their sketches whilst riding on a bike. 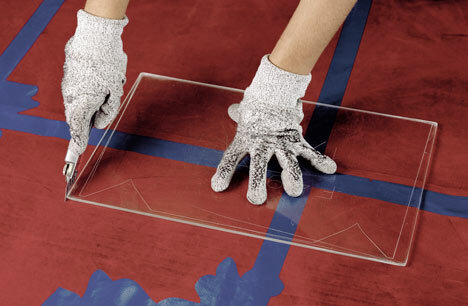 They needed a bag that was completely waterproof and very durable. They saw urban bike couriers riding in the street with strong, water-repellent bags that were full of colour. Realising that this type of bag filled the brief they set to make their own. 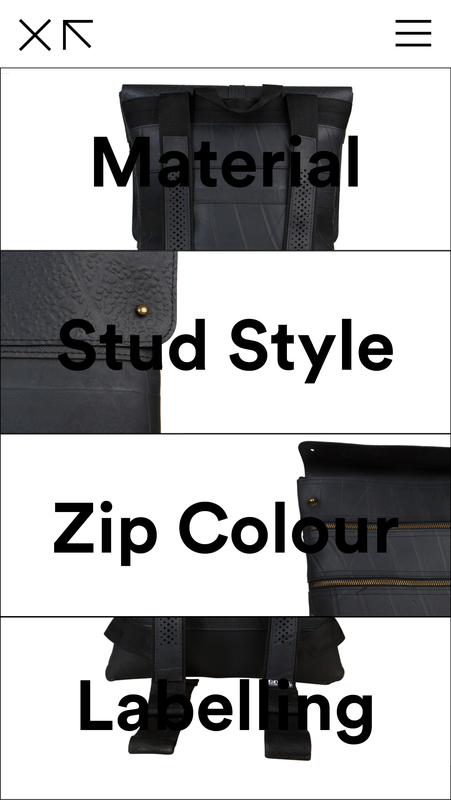 The first Freitag bag was made from an old truck tarpaulin, used bicycle tires and seatbelts. The use of recycled materials means that no bag is the same. The tarps that are used can be up to 10 years old and it is up to the individual cutting the template to decide what colour or pattern will be used for each piece. Their Graphic Design background has little correlation to either Industrial or Fashion Design processes. However, with perseverance and a multidisciplinary approach the brothers perfected the art of bag making. Their Graphic Design background means that although the colour, pattern and even texture of the tarpaulins is never the same they are able to select the perfect colour and pattern combinations to produce unique, aesthetically pleasing products every time. This multidisciplinary approach to design is what makes these products even more unique and successful. Both the brothers adamantly believe in the importance of recycling and sustainable design. Daniel highlights the importance of patience and long term thinking. He has said that “anyone who takes a serious look at the topic of sustainability quickly realises that it has nothing to do with short-term thinking. There are sensible, short-term ecological measures that can be implemented but many things must be considered from a holistic and long-term perspective.”(Freitag 2015) It is true that often we write off many environmentally friendly solutions as they do not solve the problem quick enough. Freitag 2015, About us, Freitag, Switzerland, viewed April 16 2015, <http://www.freitag.ch/about/production>. Freitag 2015, F13 Top Cat, Freitag, Switzerland, viewed April 16 2015, <http://www.freitag.ch/Fundamentals/Messenger-Bags/TOP-CAT/p/ZH_98869>. Batik is “a technique of wax-resist dyeing applied to whole cloth, or cloth made using this technique.” (Wikipedia 2015) It is an art form that has been shared by cultures around the globe. By focusing on the presence of Batik in Indonesian and Indigenous Australian cultures it becomes evident that it is a definite means through which cultural and societal values are disseminated. A study of the art form in these contexts highlights the notion that design is shaped by local context. Furthermore, I will aim to address what batik designs are able to do in the way of continuing cultural tradition and folklore. This idea is synonymous with art within the Indigenous Australian community. Indigenous Australian art is a means by which to communicate, tell stories and convey traditional values, always using motifs from the natural world. Indigenous art aims to depict “nature like animals or lakes and of course, the Dreamtime.” (Kaus 2004) This commonality with Indonesian culture meant that when Pitjantjatjara artists from the small South Australian town, Ernabella, were introduced to Batik in the 1970’s, they excelled at it; in a very unique way. Batik in the contexts of Indonesian and Indigenous Australian cultures highlights how an art form can visually convey metaphysical aspects of one’s life. Through Batik a means by which to continue important cultural tradition is found. Anthropologist Ute Eickelkamp states, “to make great art generates integrative social and cultural forces without forcing the participants to abandon their individual and local identities”. (Eickelkamp 1998) Batik in its relative contexts, not only reflects Indonesian and Indigenous Australian folklore, traditions and values, but keeps them alive. Achjadi, J. 1999, Batik: Spirit of Indonesia, trans. Dr. Woro Aryandini, Yayasan Batik Indonesia, Jakarta. Kaus, D. 2004, Ernabella batiks, National Museum of Australia Press, Canberra. 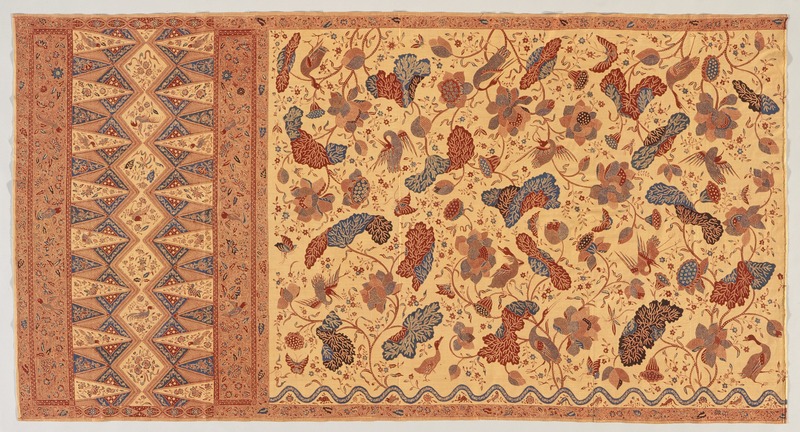 Wikipedia 2015, Batik, Wikipedia, United States, viewed April 12 2015, <http://en.wikipedia.org/wiki/Batik>. Eickelkamp, U. 1998, ‘”Drawing” the story together. An anthropologist’s leaning of Ernabella women’s art’, Exquisite Labours: The Life’s Work of Nyukana (Daisy) Baker, Art Monthly Australia, Sydney, pp. 45-8. Adamson, I. 1998, Raiki wara, Ernabella arts, Ernabella. Inger McCabe Elliott Collection 1880, Sarung Bang Biru Hijau, Java.